Definition at line 80 of file ObjCARCAliasAnalysis.h. Definition at line 148 of file ObjCARCAliasAnalysis.cpp. Definition at line 157 of file ObjCARCAliasAnalysis.cpp. 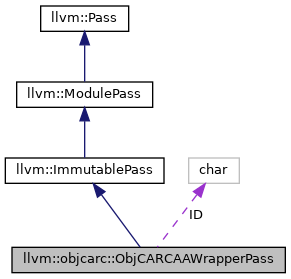 Definition at line 152 of file ObjCARCAliasAnalysis.cpp. Definition at line 162 of file ObjCARCAliasAnalysis.cpp. Definition at line 88 of file ObjCARCAliasAnalysis.h. Definition at line 89 of file ObjCARCAliasAnalysis.h. Definition at line 84 of file ObjCARCAliasAnalysis.h.